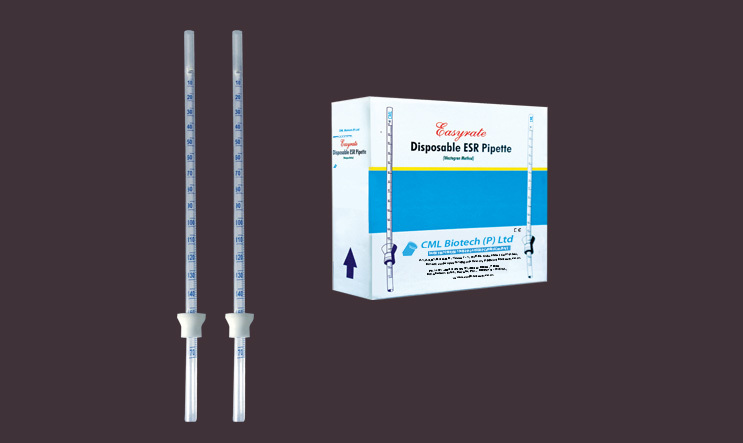 The	Easy-Rate disposable ESR	system allows	a rapid execution of ESR as per	Westergren	method. The pipette is provided	with	a fibre	cap	which permits the automated reaching	of	the	o	level	in a simple and	safe	way. At	the	interior part, at a precise distance, a little	piston allows a quick	filling	of the pipette,thanks	to the pressure	exerted within the tube. The pipette has a printed graduated	scale from 0 to 180 and consequently allows an	immediate reading in	transparence. The sample	can	be	taken in SLD-Nac - ESR Tube with 3.8% Sodium Citrate,	Double Cap (13x75mm tube) /SL-Nac(E) - ESR Tube with 3.8% Sodium Citrate,Push Cap (12x75mm Tube) or	in conventional 12x75mm PS	tube	(ADT-01).